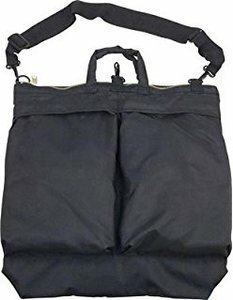 This bag was originally designed for transporting aircraft crew helmets during the Vietnam War but due to its convenience it still remains popular to this day. Also perfectly suited for storing a motorcycle helmet and ideal for urban city use. The fully padded zippered large main compartment includes two interior pockets for storing smaller items such as torches, notebooks, keys, etc. Present on the exterior are two large pockets that offer even more storage space. Can be carried via two handles or the fully adjustable shoulder strap.